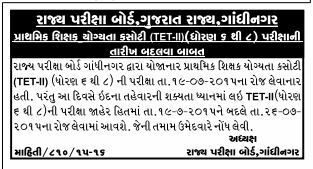 The Gujarat State Examination Board (GSEB) has released notifications for Teacher Eligibility Test (TET II) 2015 Exam Date Change. As per Official notification, TET 2 Exam 2015 Date is 19-07-2015. Now the Board has changed exam date of TET 2. New Examination Date is 26-07-2015.